AS WITH THE OTHER DENOMINATIONS of this type, the Motto Eagles have reverse dies modified by James Barton Longacre from earlier models. During the period 1866-78, mintages were very small owing to continued suspension of specie payments, and most dates are rare, some of extreme rarity. It is doubtful if much over 1% survives of any issue in this period, aside from proofs. Proofs were issued in very limited quantity, but they were made to be saved, and accordingly, higher proportions of the original issue have remained to us. No complete set in uncirculated condition of all dates and mintmarks of this period has ever been assembled. It is suspected that no uncirculated example exists of many of these dates, including most of the S mints 1866-76, most of the Philadelphia nonproofs 1866-77, and all the Carson City coins 1870-78. When these coins show up at all they are usually only Fine or Very Fine. 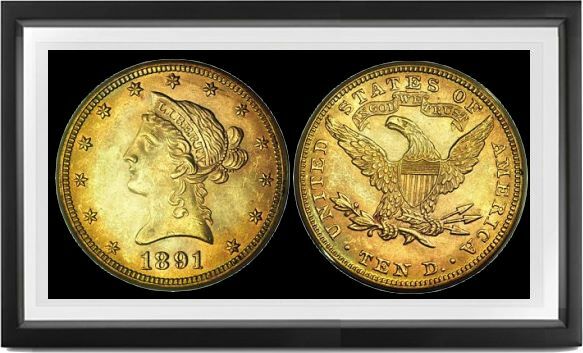 Some of the Philadelphia dates are famous rarities: 1872 (1,620 nonproofs, about a dozen known); 1873 (800 nonproofs, about 7 or 8 traced); 1875 (only 100 nonproofs, possibly 6 or 7 surviving, some of which may have begun life among the 20 proofs of the year); 1876 (687 minted, less than 10 traced); 1877 (797 minted, possibly 7 or 8 known). In each instance more proofs are known to survive than nonproofs for the reason mentioned, but even these are very rare. After the Specie Resumption Act, mintages were larger than ever before, except for a few Carson City dates and the 1879 O and 1883 O, respectively 1,500 and 800 minted, about 15 and just under a dozen respectively surviving. No reason is known for these tiny mintages. One or two uncirculated survivors can be traced for each. During the later years, varieties are infinitesimal, consisting mostly of very minute differences in date position or mintmark position. In 1883 CC there are two styles of mintmart, the commoner with small roundish c's, the rarer with tall boldface C's similar to those on the silver dollars. In 1884 the wide CC variety (rarer of the two) has an obverse die which must have been defaced by a chisel mark at the mint, then the defacements partly ground off (heavy raised straight lines show plainly on neck and in hair below ear, and through I of LIBERTY). One very rare variety of 1906 D has a straight line within top of 6, giving the appearance of a possible overdate, 1906 over 05, though no other traces of extra digit show. And double punched dates are known for 1901 proofs and for 1901 S (rarely). The 1901 S, incidentally, is probably the commonest eagle prior to 1926. Proofs are reported not only from Philadelphia (every year) but also from Denver, reportedly twelve 1906 D's and a smaller number of 1 907 D's having been made; at least one specimen of each date has been auctioned since 1957, though I have seen neither of these and cannot absolutely confirm their proof status. Coinage was interrupted pending preparation of new designs by Augustus St. Gaudens.